Cat Mazza (b. 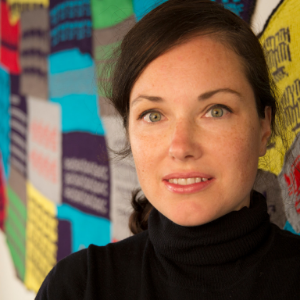 1977 Washington DC) is a visual artist whose combination of craft and digital media explores the overlaps between textiles, technology and labor. Mazza’s new sculpture Taking the Cure is currently on view at deCordova Museum and Sculpture Park through July 2019. Past work has shown at the Victoria & Albert Museum (London), the Museum of Arts and Design (New York City), Triennale Design Museum (Milan), Garanti Gallery (Istanbul), the Jönköpings läns Museum (Sweden) and the Milwaukee Art Museum. She has also exhibited at new media festivals The Influencers (Barcelona); Futuresonic (Manchester), FILE (São Paulo) and Ars Electronica (Linz). Her work has been noted in multiple publications including Artforum, Modern Painters, Art Actuel, the Washington Post and various books on art, craft and politics. Mazza has given artist lectures at the California College of the Arts, School of the Art Institute of Chicago, MICA, among several other venues. Mazza is Associate Professor of Art at University of Massachusetts Boston and has a MFA from Rensselaer Polytechnic Institute (2005) and a BFA from Carnegie Mellon University (1999).